While the man was on his way, some of his servants met him with the news that his son was alive and well. He asked them when the boy had begun to get better, and they replied, "Yesterday afternoon at one o'clock his fever suddenly disappeared!" Then the father realized that that was the very time Jesus had told him, "Your son will live." And he and his entire household believed in Jesus. This was the second miraculous sign Jesus did in Galilee after coming from Judea. Sometimes we get the special grace of having our faith confirmed through obvious answers to our requests. These blessed moments not only enrich us, but they also give us something to share with our family and our friends. This sharing inspires and strengthens the faith of those who know the story. With whom have you shared the story of God's work in your life? Who in your circle of family and friends needs to know your story? 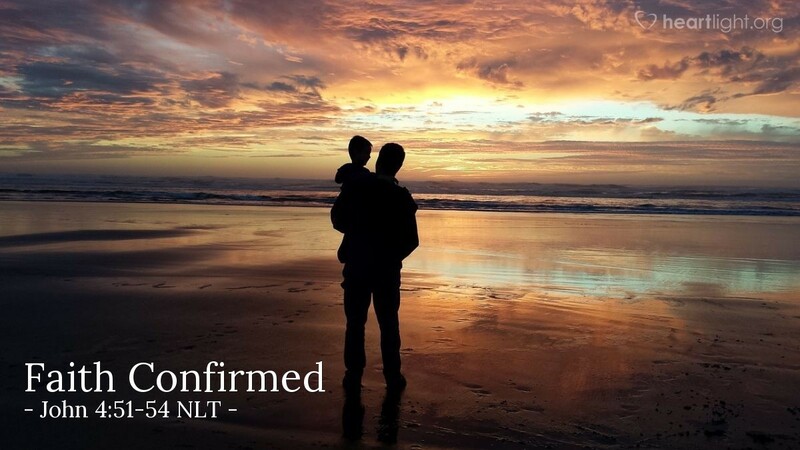 Thank you, dear Father, for the many ways you have confirmed my faith in you. While I have gone through seasons of doubt and struggle, you have also blessed me with obvious answers to my prayers, and your leading in my life has been clear. Bless me as I try to share this story with those who are closest to me. In Jesus' name. Amen.